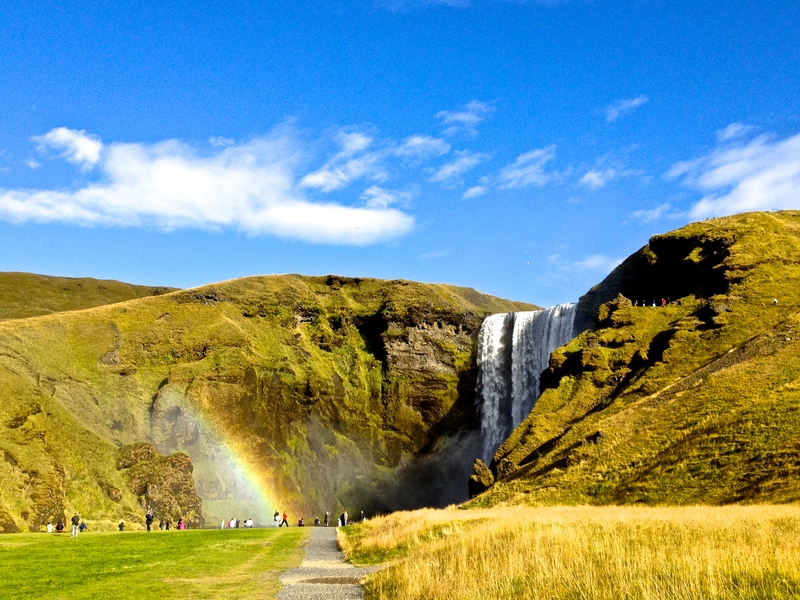 A two hour drive from Reykjavik along Iceland’s southern coast will take you to Skogafoss-one of country’s most famous waterfalls, and, in my opinion, it’s best. Because the coastline has receded seaward in this area, the highlands meet the lowlands, allowing visitors to walk right up to the falls. It is also easily accessible, as there is car park a short walk from the base of the falls. 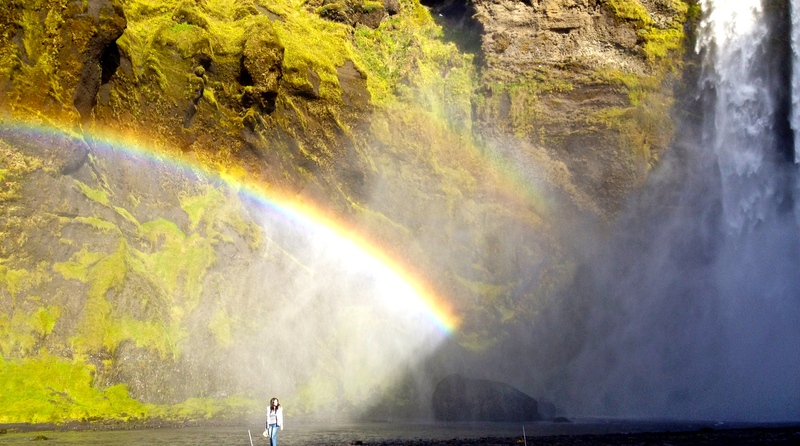 The waterfall’s enormous drop creates a consistent spray, so it is very common to see a single or double rainbow on a sunny day. 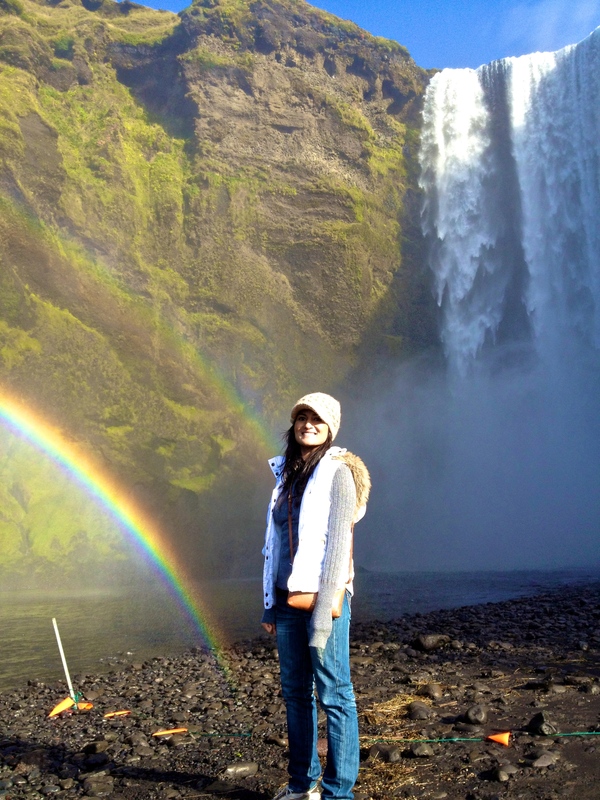 Skogafoss was also the backdrop for scenes in the movie Thor: The Dark World. Plan a visit in late June, July or August when the weather is the warmest and the days are the longest. Summer travel, while more expensive, allows you to make the most of your time there. During the longest days in the summer, travelers will have nearly 24 hours of daylight. If you want to get the best deals on hotels in Iceland, you may choose to travel in May or September. In the summer months you will need to wear layers. The temperature can vary between the high 60s during the day to the mid 40’s at night. Bring waterproof boots, so you can walk right up to the falls. Off season travelers will need winter clothing to keep warm while sightseeing. The easiest way to arrive at Skogafoss is by car. It is under a two hour drive from the capital city and can be easily done as a day trip. The cheapest way would be to hitchhike or take the bus. Strætó provides bus service in Reykjavik and to other parts of Iceland. Bus route 51 travels from Reykjavik (the bus stop in the capital city is called “Mjodd”) to Vik as well as Jökulsárlón. In addition to Skogafoss, Jökulsárlón is one of Iceland’s most famous sites. It is 2.5 hours from Skogafoss. Between, Skogafoss and the glacial lagoon lies the seaside village of Vik. Stop here to enjoy the black sand beaches. Closer to the capital city, is the famous Golden Circle route which covers geysirs, the Thingvellir National Park, and Gulfoss (another waterfall).